Home > About Massey > News > Opinion:Rethinking Politics - is Nat-Lab cooperation conceivable? Is it time to consider a new, more consensus-driven approach to politics? The lead up to the 2017 elections has been notable for a number of things. Not least was the offer by TOP leader Gareth Morgan to provide Labour with any policy information they might like – preferring to see policies adopted over oppositional political tactics – and the admission in the first leaders’ debate by Jacinda Ardern that National might have gotten a few things right during their term(s). The reasons why these two things stood out, even from ‘Jacinda-mania’ or the stories about the ‘missing $11 billion’ doing the rounds, is that they went against traditional assumptions about the way politics works. Perhaps it is time to seize on a new way of ‘doing politics’ more generally. As political theorist Robert Dahl most famously argued, democracy is about competition and opposition. Those in power must be able to be displaced and replaced. This notion is evidenced by the nature of Parliament literally having ‘sides’ as well as by the cultural mores of pointing and shouting at each other from across the room. Yet are we missing something by adhering to this antagonistic style of politics? In the spirit of disclosure, I’m not a specialist in forms of domestic democratic politics, indeed my field is international affairs, but as an informed observer I do wonder if we are foolish to not consider an at-first-glance highly unlikely scenario. Why is it, for example, that the two most popular parties in New Zealand, National and Labour, will, if necessary, consider working with smaller parties to create a government through coalition and yet there has been no serious mention of these two fairly-similar parties working together? Such a suggestion was termed ‘utterly absurd’ by 61 per cent of respondents in a Massey online poll organised by my colleague Associate Professor Grant Duncan, yet Germany has in fact arguably utilised this ‘grand coalition’ approach to good effect. Should there be a National-Labour government most people would get most of the policies they desired. And these two parties share a fairly significant overlap in terms of basic policies and basic objectives. Both are relatively centrist in nature. Unlike contemporary American or British politics there is no yawning chasm between the two. Time for a new, less divisive approach? Yet the possibility of these two parties working together has not really entered the conversation. Other than the impact of the long shadow cast by previous dark eras of First Past the Post systems whereby these two parties were monolithic oppositional blocs, there doesn’t necessarily seem to be any major reason as to why there is no talk of a Nat-Lab government. Perhaps it is time to consider such a possibility. Management and leadership research has recently demonstrated the importance of fostering cooperation and mutual problem-solving. Hierarchical, authoritarian and aggressive modes of management and leadership have been shown to have some shortcomings. In international affairs, for example, the compromise and consensus approach within the Association of South East Asian Nations was for a long time pooh-poohed by others as too slow and for being about ‘talk only’. Yet more recent years have seen this organisation touted for keeping the peace within South East Asia and for attaining a sustainable form of regional politics. Although we might not want everything done ‘by committee’, this shift in business and other organisational cultures might be worth considering more closely when it comes to rethinking the nature of politics in New Zealand. How might such a phenomenon work? Well, whichever party gains the most votes gets to have their leader as Prime Minister, the next party gets Deputy. Key cabinet positions are either worked out in similar fashion or in such a way as to have shadow advisors from each working in an advisory capacity. It’s a bit like trying to get a family with many children to function. At times in selecting from a range of options, the best way forward is to ascertain just which of the options are most important to which child and to then do the best to accommodate these choices in an ‘as fair as possible’ manner. Negotiation and compromise might then become centrally important tenets in politics rather than the self-aggrandising, winner-take-all approach that has dominated thus far. This could also help to stave off concerns about the tyranny of the majority – if negotiation is a greater part of the political culture then no one would want to see minorities subject to discrimination. It also brings in the question of voting in a more ‘positive’ manner. That is, rather than voting mainly to keep a party out of power, which may occur with this election, the population is encouraged to think more about the values and priorities that they want. Negotiated solutions the way to go? In terms of the mechanics of such a suggestion, in cases of disagreement, if an issue is so important as to motivate either party from acting to prevent a Bill from passing through the house, or to halt a visit by a visiting dignatory or to boycott an event, then perhaps more negotiation needs to occur. What would be the main areas of disagreement anyway? Tax appears to be one. Yet perhaps this can be solved by a more nuanced taxation system and by increasing wages in certain fields given that a motivation for increased taxation for Labour is to aid the poor, in particular the working poor. Environmental issues are getting to the point where not even the most hardened can claim nothing needs to be done. Defence and foreign policy priorities are somewhat similar between the two, and the main sticking point – to ally or not to ally with the USA – is becoming a moot point as Trump does a stand up job of making the option of unquestionably sticking by the US through thick and thin (think an ill thought out war with a nuclear North Korea) a less and less attractive option. This may to some degree gloss over other policy differences but surely National and Labour could be seen to be closer than some of the other parties they are willing to work with? Even fundamental ideological differences have been subject to mellowing – note ex National Prime Minister Jim Bolger suggesting that neo-liberal politics wasn’t all it was stacked up to be. Perhaps it’s a question of accepting that most of the policies of National and Labour are situated in a fairly centrist to center-left situation on the political spectrum. Unlike the rise of the far right and the return of stronger-left candidates in the form of Corbyn and Sanders, New Zealand is not (yet?) riven by two majorly different factions within society. 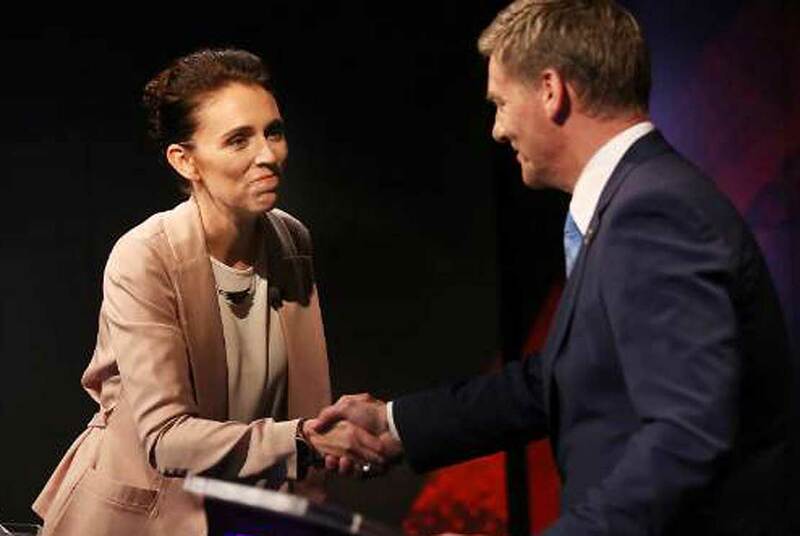 With only a smidgen of difference perhaps it is time to have both parties ‘win’, thereby delivering a stronger win for the eighty percent or so of New Zealanders who would vote for these two parties. Just a thought from a politically minded passerby. Associate Professor Beth Greener is a senior lecturer on international relations and international security in the School of People, Environment and Planning.